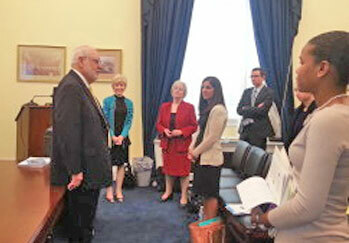 IHPC Chairman Len Wisneski, MD, discusses integrative health with US House staff members at April policy briefing on Capitol Hill. On April 10, 2014, key staffers for numerous members of the US House of Representatives and US Senate were treated to unusual fare at a briefing entitled “Easing the US Healthcare Crisis: The Role of Integrative Health Care.” Staff for some 17 US Senators and seven members of the House, together with representatives from ten outside organizations were among the roughly 70% of attendees who signed-in. Among those in attendance were staff members for the powerful US Senate Health Education Labor and Pensions Committee (HELP), as well as counterparts from Appropriations and the Special Committee on Aging. Margaret Chesney, PhD: CAHCIM chair: I think the presentations built well. I was the set-up person, using material from the IOM Report “Shorter Lives, Poorer Health” to identify what the crisis is; distinguish between the contributions of prevention and those of health promotion/health creation; also the needed synergy between integrative health care and integrative health policy. Margaret Chesney, PhD, chair of the Consortium of Academic Health Centers for Integrative Medicine (CAHCIM) and integrative medicine leader at UCSF Osher Center, explained IM/IHC and used heart disease exquisitely to illustrate the problem, and the difference between usual care and integrative care. She illustrated the growth of IM/IHC through the increase from 8 to 57 centers in CAHCIM between 1999 and today; and the comparable growth in number of hospitals offering integrative healthcare services. She offered good cost data, including Ornish’s work on both heart disease and prostate cancer – the latter showing telomere growth which is hugely important. Courtney Baechler, MD, MS, a cardiologist, and Chief Wellness Officer & Vice President, Penny George Institute for Health and Healing, Allina Health, presented on Allina’s growth from 2003-present. She gave the audience a good picture of the size and complexity of the Allina system; the decision to move from a single site – the Penny George Institute of Health and Healing – to ultimately seeking to integrate all 13 hospitals. The range of things Allina is doing – in-patient and outpatient, community-based programs, etc. is impressive – as is their data. Across these presentations people saw examples of IM/IHC in relation to chronic pain, heart disease, cancer, spinal fusion, and more. And the problem identified in the first presentation – that the US has been getting a horrible return on investment when it comes to health care $$ spent, was well-answered with a look at Allina’s and Ornish’s cost data. 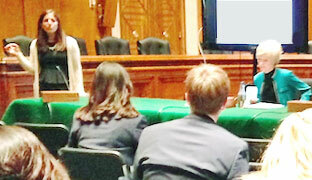 Courtney Baechler, MD of Allina Health Systems addresses US Senate staff at IHPC congressional briefing on April 10. Then-ACIMH chair Margaret Chesney PhD, is at right. See the original article at The Integrator Blog (scroll down to the second page).